Back in August I saw an article by Tony Buckland in Kitchen Garden magazine singing the praises of some unusual hoes from Russia. I’ve used various hoes in the past but I’d never seen ones quite like this before. They’re imported into Britain by Vladimir Kondratyuk who kindly sent me some of his tools to test. Vladimir tells me that there’s always been a big tradition of home growing in Russia and his uncle, who is also an engineer, developed the Ploskorez range of tools. His aims were to work more efficiently and effectively saving effort whilst maintaining the micro-ecology of the top soil. As a keen allotment holder, Vladimir recognised the benefits of the range and started importing them when other plotholders started asking where they could buy them from. The first one is the Swage Hoe. 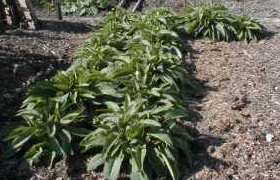 The shaped and sharpened blade is designed to sweep under the weeds like a knife or, for stubborn weeds, to dig them out using the point. This point is useful for weeding in tight spots between rows and for drawing drills when sowing seeds. Having drawn a drill, the flat blade is ideal for pushing back the soil and tamping down. The Swage is one of those tools you wonder how you managed without when you have it. 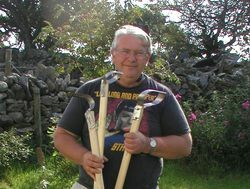 There’s a great little video on the showing uses for the Swage hoe on the Ploskorez web site. 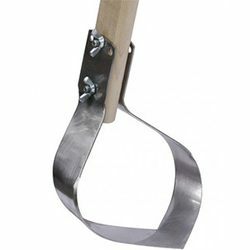 The handle is natural Silver Birch, which is comfortable to hold and the tool is very lightweight, 0.7Kg, which makes it easy to handle especially for those with difficulties due to age or disability. 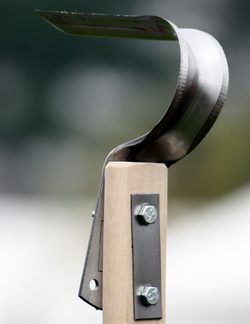 The next tool is the Stork, a diamond shaped stainless-steel hoe that is ideal for preparing the ground and weeding. 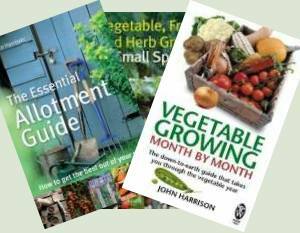 It’s exceptionally easy to control so there’s less chance of slipping and decapitating your prize brassicas. The head is adjustable so you can set it at the perfect angle for the way you work by undoing the butterfly nuts and re-positioning the bolts. This takes less than a minute. You soon get used to using the Stork in different ways to cope with different situations; either point down or sideways on. It’s hard to explain but easy when you use it for a few minutes. 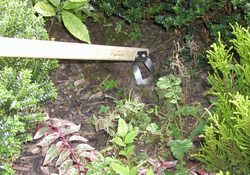 With both the Stork and the Swage you can draw them through the soil to aerate without churning the top layer and bringing up more weed seeds to germinate. The small Swift is basically a smaller version of the Stork with a differently shaped blade. Val gave it a try for weeding in the back border which is tightly planted and normally a job you have to do by hand. She found it perfect for the job and easy to handle. I do have a Dutch hoe with a narrow blade that I use for weeding close spaced crops such as onions but the small Swift is more controllable so hopefully I’ll not be cursing as I chop up another onion.